We hear them. After big earthquakes, we say them. But what do these terms mean? What do they mean for what we felt and what we will feel the next time? Do we really understand what seismologists are saying? This section describes how earthquakes happen and how they are measured. It also explains why the same earthquake can shake one area differently than another area. It finishes with information we expect to learn after future earthquakes. An earthquake is caused by a sudden slip on a fault, much like what happens when you snap your fingers. Before the snap, you push your fingers together and sideways. Because you are pushing them together, friction keeps them from moving to the side. When you push sideways hard enough to overcome this friction, your fingers move suddenly, releasing energy in the form of sound waves that set the air vibrating and travel from your hand to your ear, where you hear the snap. The same process goes on in an earthquake. Stresses in the earth's outer layer push the sides of the fault together. The friction across the surface of the fault holds the rocks together so they do not slip immediately when pushed sideways. Eventually enough stress builds up and the rocks slip suddenly, releasing energy in waves that travel through the rock to cause the shaking that we feel during an earthquake. Just as you snap your fingers with the whole area of your fingertip and thumb, earthquakes happen over an area of the fault, called the rupture surface. However, unlike your fingers, the whole fault plane does not slip at once. 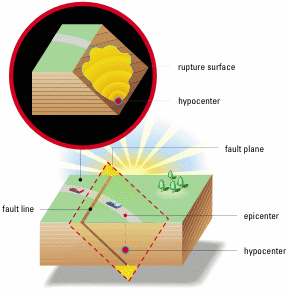 The rupture begins at a point on the fault plane called the hypocenter, a point usually deep down on the fault. The epicenter is the point on the surface directly above the hypocenter. The rupture keeps spreading until something stops it (exactly how this happens is a hot research topic in seismology). Part of living with earthquakes is living with aftershocks. Earthquakes come in clusters. In any earthquake cluster, the largest one is called the mainshock; anything before it is a foreshock, and anything after it is an aftershock. Aftershocks are earthquakes that usually occur near the mainshock. The stress on the mainshock's fault changes during the mainshock and most of the aftershocks occur on the same fault. Sometimes the change in stress is great enough to trigger aftershocks on nearby faults as well. An earthquake large enough to cause damage will probably produce several felt aftershocks within the first hour. The rate of aftershocks dies off quickly. The day after the mainshock has about half the aftershocks of the first day. Ten days after the mainshock there are only a tenth the number of aftershocks. An earthquake will be called an aftershock as long as the rate of earthquakes is higher than it was before the mainshock. For big earthquakes this might go on for decades. Bigger earthquakes have more and larger aftershocks. The bigger the mainshock, the bigger the largest aftershock, on average, though there are many more small aftershocks than large ones. 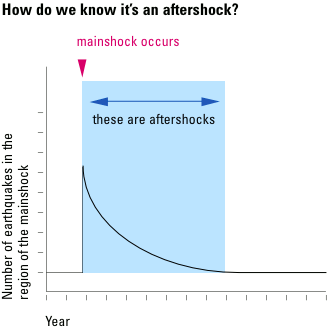 Also, just as smaller earthquakes can continue to occur a year or more after a mainshock, there is still a chance for a large aftershock long after an earthquake. Sometimes what we think is a mainshock is followed by a larger earthquake. Then the original earthquake is considered a foreshock. The chance of this happening dies off quickly with time just like aftershocks. After three days the risk is almost gone. Sometimes, the chance that an event is a foreshock seems higher than average - usually because of its proximity to a major fault. The California Emergency Management Agency will then issue an advisory based on scientists' recommendations. These are the only officially recognized short-term "predictions." Earthquakes occur on faults. A fault is a thin zone of crushed rock separating blocks of the earth's crust. When an earthquake occurs on one of these faults, the rock on one side of the fault slips with respect to the other. Faults can be centimeters to thousands of kilometers long. The fault surface can be vertical, horizontal, or at some angle to the surface of the earth. Faults can extend deep into the earth and may or may not extend up to the earth's surface. Earthquakes recorded by seismographic networks are mapped and indicate the location of a fault. Some faults have not shown these signs and we will not know they are there until they produce a large earthquake. Several damaging earthquakes in California have occurred on faults that were previously unknown. How do we study faults? Surface features that have been broken and offset by the movement of faults are used to determine how fast the faults move and thus how often earthquakes are likely to occur. For example, a streambed that crosses the San Andreas fault near Los Angeles is now offset 83 meters (91 yards) from its original course. The sediments in the abandoned streambed are about 2,500 years old. If we assume movement on the San Andreas has cut off that streambed within the last 2,500 years, then the average slip rate on the fault is 33 millimeters (1.3 inches) per year. This does not mean the fault slips 33 millimeters each year. Rather, it stores up 33 millimeters of slip each year to be released in infrequent earthquakes. The last earthquake offset the streambed another 5 meters (16 feet). If we assume that all earthquakes have 5 meters (5000 millimeters) of slip, we will have earthquakes on average every 150 years: 5000 millimeters divided by 33 millimeters per year equals 150 years. This does not mean the earthquakes will be exactly 150 years apart. 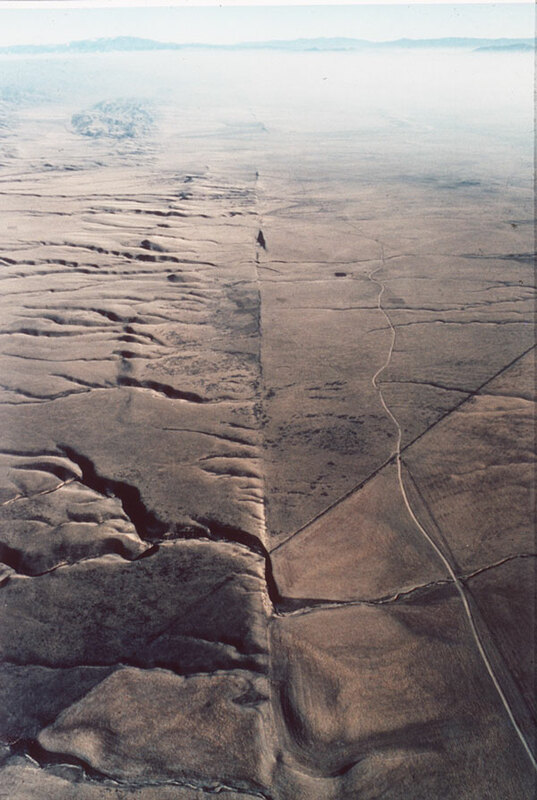 While the San Andreas fault has averaged 150 years between events, earthquakes have occurred as few as 45 years and as many as 300 years apart. LEARN MORE: See the web resources listed here.